Guitar Hero Arcade is the first coin-op version of the popular home market game series. Developed by Raw Thrills, Konami, and Activision, the game is based heavily on the Guitar Hero III gameplay. This 2-player upright cabinet has been developed and designed to draw fans and players out of their homes and into locations where a commercial arcade version can be found. The arcade version offers players the chance to select their favorite song from a library of 50 popular titles, their favourite rocker from 11 playable characters, and their faourite stage from 8 venues. Choose either lead or bass guitar and rock with your favorite band. The machine features a 32″ LCD monitor and High-Def Graphics to give the players an in-your-face experience unique to arcade play. 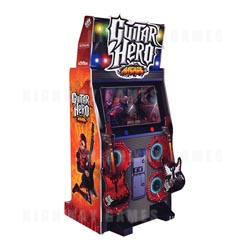 The machine is equipped with 2 Enduro-AX Industrial strength guitars, an 8 speaker sound system and over 400 LED lights - Guitar Hero Arcade will turn any location into a concert hall. With a little promotion, operators can increase weekly revenue by turning any night at their locations into a profitable Guitar Hero Arcade competition night! The guitar controllers are industrial strength and are based on the 'Guitar Hero World Tour' guitar, sans the slide mechanic. See a problem with the information provided? We need your help to make our Database the best it can be.